The Shiny Green Leaf Paphiopedilum is an exotic and charming orchid that has become the desire of many enthusiasts of orchid and hybridisers. 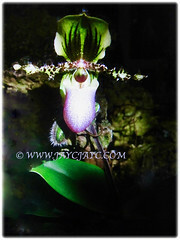 Paphiopedilum glaucophyllum is assessed as endangered in the IUCN Red List of Threatened Species. 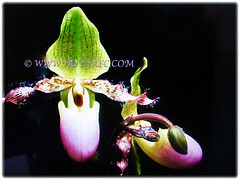 Botanical Name: Paphiopedilum glaucophyllum (syn. : Cypripedium glaucophyllum, Cordula glaucophylla). Common Names: Tropical/Asian Lady’s Slipper, Shiny Green Leaf Paphiopedilum. Etymology: The genus name, Paphiopedilum is from the word Paphos, a town in Cyprus, the favourite island of Aphrodite, the goddess of beauty. Pedilon is the Greek word for slipper. The specific epithet glaucophyllum is named for the waxy coating on the leaves,(glaucous, meaning covered with a greyish, bluish or whitish waxy coating that is easily wiped off). Origin: Native to Indonesia, east and southwest Java (Mount Semeru, Lumajang) and in Central Sumatra. Plant type: A terrestrial orchid. 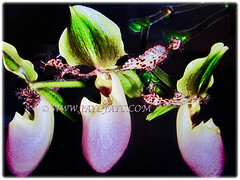 Features: Paphiopedilum glaucophyllum is from the genus, Paphiopedilum that comprises of 96 accepted species. It is a terrestrial orchid that grows between 30-45 cm tall. Its leaves are waxy coated, clear blue-green, oblong-elliptic and narrow, about 20-30 cm long and 4-6 cm wide with basal margins ciliate. 20 or more flowers, opening sequentially, 15-20 cm long and about 8-11 cm wide. 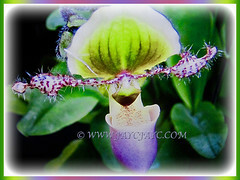 The upper sepal is green and purple striped, the lateral petals are twisted, purple mottled and hairy, the labellum is white at the base, with a progressively increasing pink-purple dotting. 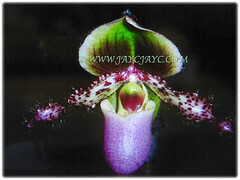 The pouch-like lip or labellum reaches 4.5 cm. 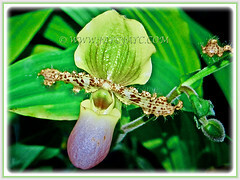 Its shape resembles a lady’s slipper, hence the common name of Tropical Lady’s Slipper. This species blooms repeatedly with two flowers, producing a new one once the old one is fallen. 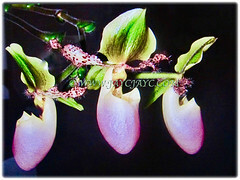 Culture (Care): Paphiopedilum glaucophyllum or Tropical Lady’s Slipper grows easily with the least maintenance. Moisture: Medium water needs. Water when the top feels dry. Do not overwater to avoid rotting the roots. Others: Feed once fortnightly with a balanced orchid fertiliser. A weakly ¼ strength works well. Once a month use clear water to flush any accumulated salts from the potting mix. 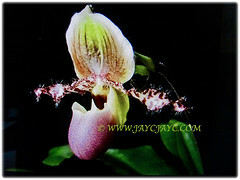 Paphiopedilum glaucophyllum or Tropical Lady’s Slipper is intolerant of frost. It can be grown outdoors in frost-free regions. It requires an average home temperature range of 18-24°C during the day and 13-18°C during the evening to thrive well. 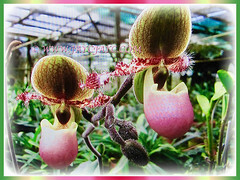 Paphiopedilum belongs to the low light group of orchids and can be easily grown as houseplants. Indoors, grow them under intermediate temperatures and bright light. To induce blooming reduce watering in the spring and winter. Flowers are long-lasting, about 2-3 months. The flowering period is very long, extending from the spring till winter. It can bloom for a year to 18 months on the same spike, making it almost a perpetual bloomer. Each flower lasts about 3-4 weeks and is replaced by a new one. When a new growth begins its flower spike and the older growth is still flowering, it is best to cut the older flower spike off to put more energy into the plant for better growth and flowering. 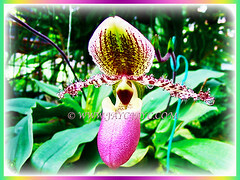 Usage: Paphiopedilum glaucophyllum or Tropical Lady’s Slipper is an ornamental plant with long lasting blooms. Suitable for growing in containers. Ideal as an indoor orchid plant or houseplant as it’s very adaptable to low lighting. It is a perfect species collection for its small size and longevity of flowering.